At Pets & Vets Animal Clinic, we love, care, and treat your pets as if they were our own. We offer comprehensive diagnostics, emergency care, vaccinations, surgical services, and just about anything your pets need to grow and live healthy. Providing quality care for your pet is our number one priority. 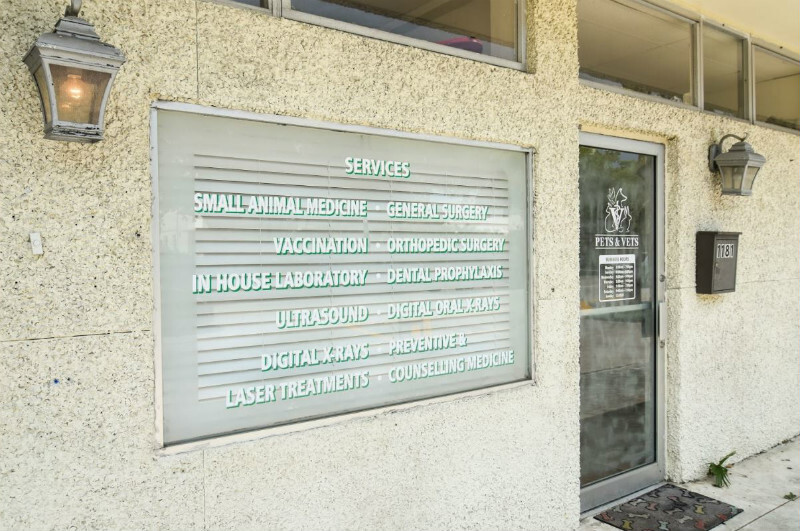 We treat and provide veterinary services for felines, canines, and exotic pets patients at a modern facility in Miami Beach with the help of our professional and highly-experienced staff. Pets & Vets Animal Clinic serves the entire Southeast Florida area from Hollywood to Miami. My male puppy hot neutered yesterday. Not only was the procedure fast, and my puppy isn't that ill spirited today; but today they called to follow up. (That's normal) When we told Javier's assistant that the cone we had purchased at a store wasn't fitting my puppy properly, he asked us to come in. I thought my puppy was going to have "issues" when we got there, but he started wagging his tail, and playing with all the employees. TALK ABOUT A HAPPY CUSTOMER. His new adoptive sister came with us to meet the crew, and she got in on all the excitement. The BEST VET IN MIAMI! This place is great. The doctor (Javier) really knows his stuff, and our puppy and us all feel very comfortable when we visit. We always get the best advice on medication and conditions.If you have a new puppy, bring it here right away! You will leave with everything you need vaccines, chips, exams, registration, etc... Your little guy will get a great healthy start. If this is your very first puppy ever, then you must come here. You will learn everything you need to take good care of your new buddy. Javier, the doctor, is amazing.Thankfully I've never had to take my cat in for anything serious... Other than yearly Health exams and a few travel certificates... But every time I'm sitting in the waiting room entrance with some other people, I hear incredible stories about how Javier has saved/helped their pet in ways that other places could not. ( ok so the waiting room is tiny and you might have to wait a little bit past your scheduled appointment time so definitely don't go when you're pressed for time! But still totally worth it !! )Javier is extremely genuine and friendly and makes you feel like he actually cares about your pets well being. He doesn't rush the visit and answers any questions and/or concerns. Everything is very reasonably priced and he is very honest.I'm very grateful to have found this wonderful and convenient place. Give your pet the care and attention they need to live long, happy and healthy lives. Pets & Vets Animal Clinic offers you a variety of veterinary services for that special member of the family. From wellness exams and surgical care to grooming and dental care, our team of experts will make your dog, cat, bird, or exotic pet feel much, much better. Pets & Vets Animal Clinic is your trusted veterinary center in the Miami Beach area. Our team is ready to handle any emergency situation 24/7 as well as to performing physical exams, tests and to administer all their important vaccines. Visit us today at our Miami Beach location, call us to schedule an appointment or send us a message with all your inquiries.